“I take care of hunger before it becomes a problem.” This is a mantra most paddlers can relate to but many need practice to live by it. Hanger—hunger anger—is real, and it becomes a new beast as the seasons change, sneaking up on you and pouncing when temperatures fluctuate, fingers are still frigid and allergies become an additional annoyance. 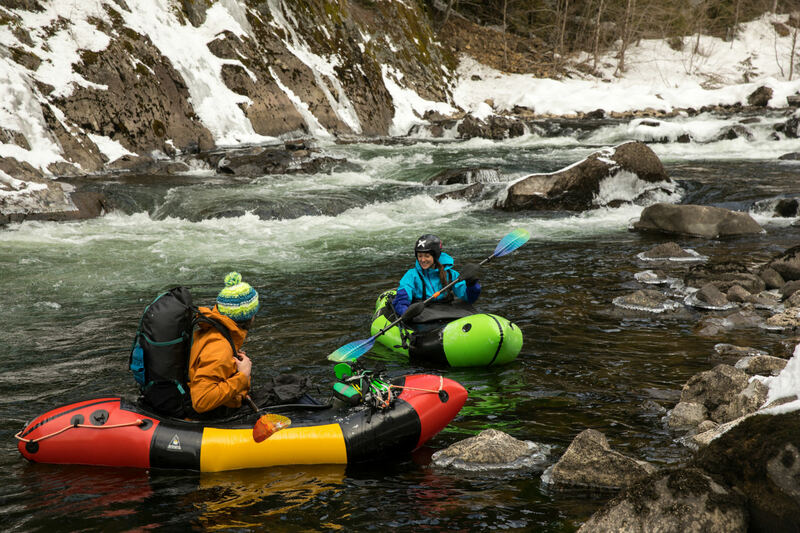 Spring paddling involves cold, and often high, water, which means the beast of appetite takes on a new level of fury. But with a little planning and prep, you can have the necessary calories on hand to ensure you fuel the fire within. Literally and figuratively. The easy option is to buy a box of energy bars or a bag of beef jerky from the grocery store. But one look at the ingredients (and price) may force you to think twice. 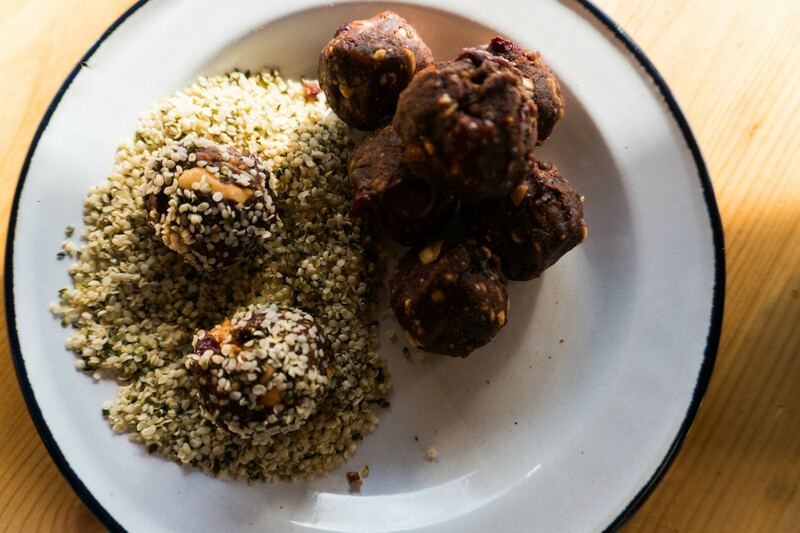 Overpackaged and often crammed with spoonfuls of hidden sugar, there are many homemade options that will hit your bloodstream with a similar boost of sugar, protein and salt, without the heinous price tag or subsequent cavities. 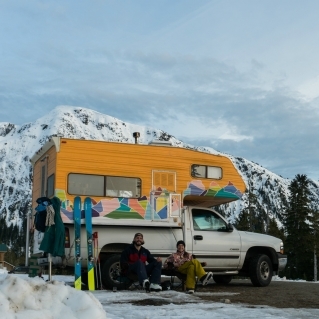 These recipes are so quick and easy, you can even make them in a mobile home as you drive from the valleys and into the snowy mountain rivers! The ingredients are easy to find at regular grocery shops (or better yet, can be found in your cupboard). They are no-bake and no BS. When the levels are good, when the sun is shining and you have limited hours of daylight—but hey, they are growing longer—it’s easy to blow past lunch. On-the-go ‘grazing’ options require a bit of forethought and planning but the calories (and flavor) will give you what you need to keep paddling. These five-ingredient Chocolate Peanut Butter Chia Bars are an easy, no-bake recipe for healthy snacking. Vegan and naturally sweetened, they’re open to improvisation to accommodate allergies and pallets. Chewy without being too raw, firm enough to hold shape and not too time-consuming to make. Just expect your first batch to include a little battle with the consistency. First and foremost, be sure to really stir your peanut butter or use the bottom of the jar to avoid excess oil. 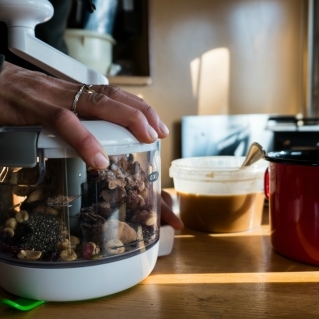 Add all of the ingredients to a food processor and blend until the ingredients break down and become a mostly cohesive mixture. For best results, blend wet and dry ingredients separately, then mix together once pureed. If you don’t have a food processor this can be done by hand. A sharp knife and some patience help. Don’t worry if there are little pieces of nuts remaining. To test consistency, grab and a handful of the mixture and see if it holds together when you give it a squeeze. Too sticky, add more chia or some oats. 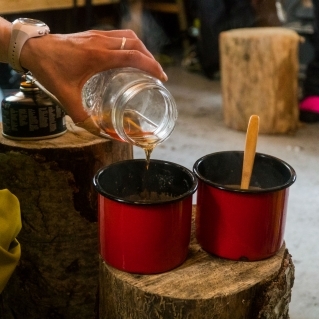 Too dry, add a teaspoon of water (or coffee!) Then, press the mixture into a backpack friendly container with lid. Hint: line container with parchment paper for stick-prevention and easy cleanup. If your consistency isn’t right, don’t panic. 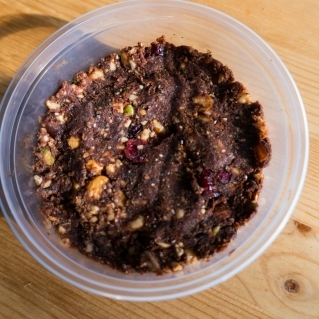 You can mold into balls and roll in oats, chia, cocoa powder, nuts, etc. to remedy stickiness. Regardless of your method (pressed into a container or rolled into balls), refrigerate for at least 30 minutes before slicing into desired bar size or consuming. Store bars in the refrigerator or take the lot with you on the water. Who knows, they might help score a shuttle ride or make new friends. 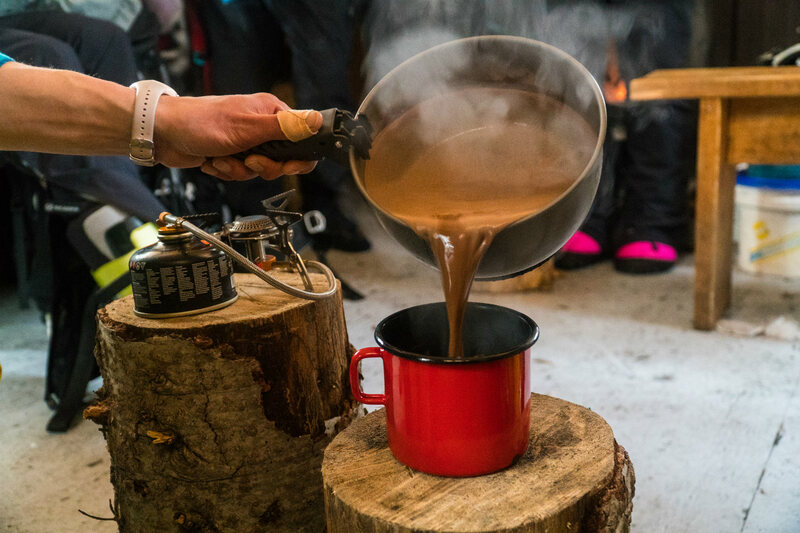 Get hydrated, warmed up, fueled up and fired up with this simple vegan, protein-packed hot chocolate! 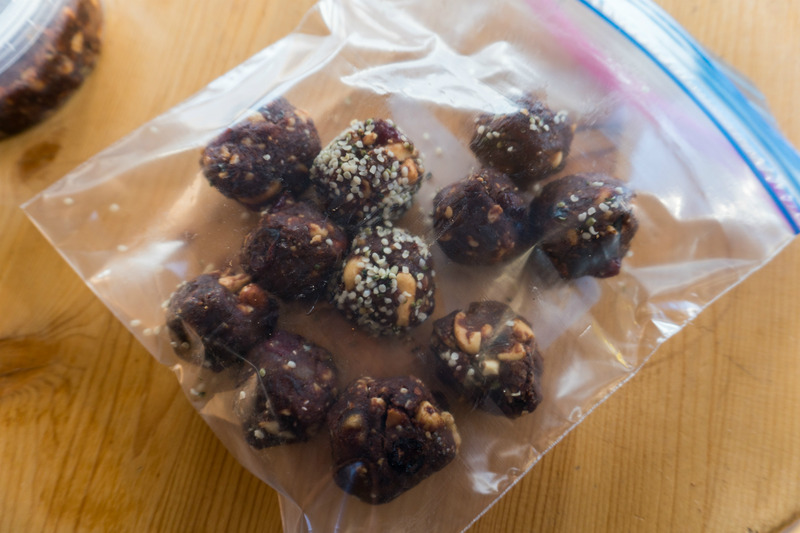 Fast and calorie-packed, the ingredients are simple and easy to throw in a drybag. 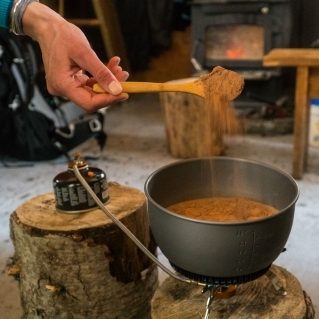 Just don’t forget a jetboil/stove! 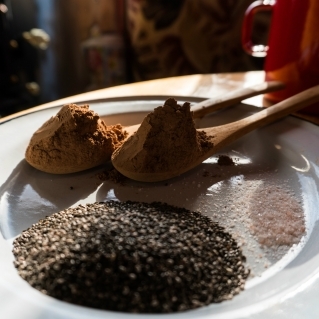 Ready in under three minutes with only five ingredients, this high(er) protein hot chocolate will keep you full longer and incorporates all the flavors of your favorite sugary hot chocolate without the packet of powdered grossness. Pre-measure and pack in just the needed amount of each ingredient. Gluten free, dairy free, and vegan. As with most beverages, there’s an optional ‘adult’ version, where a little whiskey goes a long way. Boil water and purify according to your climate and location. Just because it’s cold out doesn’t mean your water is cleaner. 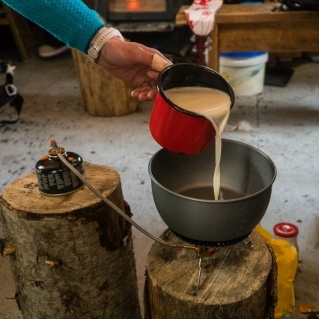 If you’re using milk or milk substitute, heat it, stirring often and keeping a close eye on it. 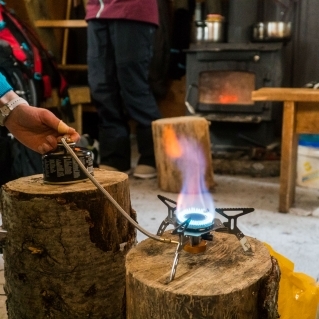 Camp stoves can burn the milk, creating a mess of your pot and stove. Slowly mix in protein powder, cocoa powder and chosen sweetener. Place on the stove for final mixing and dissolving. Serve and spike! 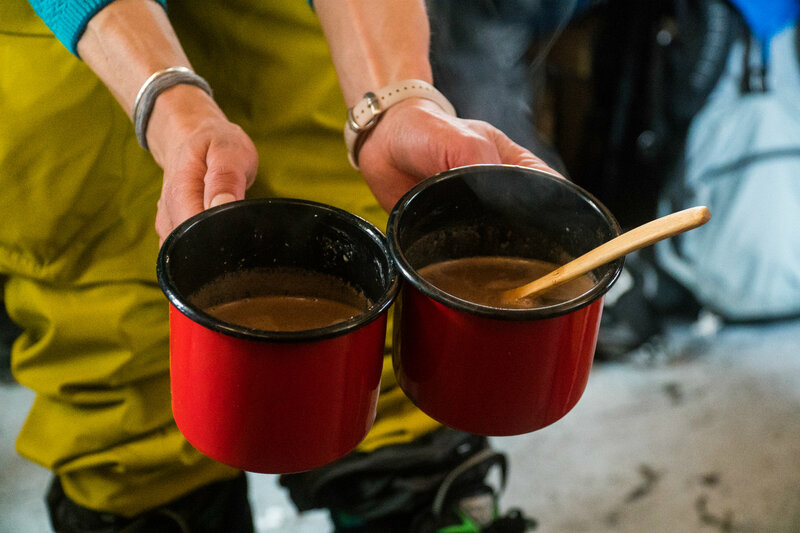 Pour into your buddy’s cups and add healthy fats like butter or coconut oil for some expedition calories, or drop in a splash of whiskey or tequila for some extra ‘warmth.’ Toast, sip and enjoy with friends. It’s easy to overdue the PB&J. And egg salad can only be your go-to for so long. Try something fancier with only a couple more steps than a sandwich. 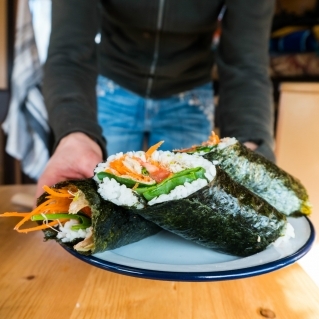 The sushi burrito uses low-impact seafood and loads of raw veggies, for a meal that’s good to your body and Momma Earth. This is a lunch you can layer into decadence or diminish to minimalism. 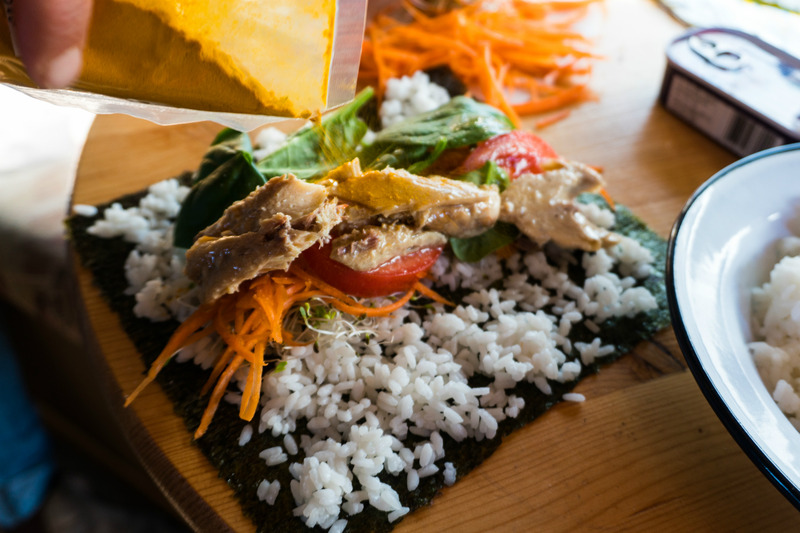 Using canned fish that’s ocean-friendly, add nori (seaweed) and hardy veggies with your favorite sauce (plus some turmeric for anti-inflammatory properties), and…boom, instant paddling power food. Note: Use flour or corn tortillas if you aren’t into the texture and fishy flavor of nori. Make one cup of rice per two people. For white rice, the water-to-rice ratio is 2:1 cups. Chop veggies. Rapidly cool rice in the freezer or outside in the snow on a tin foil lined baking sheet. 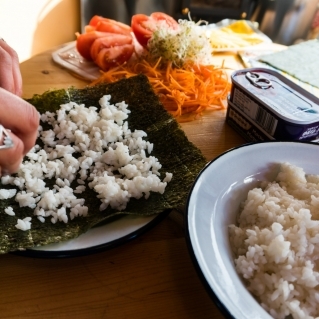 Slightly wet your hands, and spread a palm-sized ball of rice onto a piece of nori, leaving one inch of bare nori along one side. 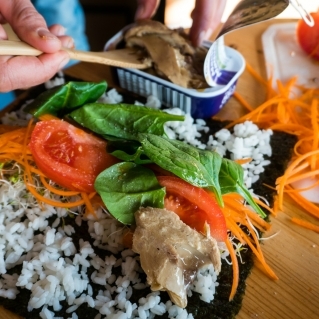 Layer desired veggies and seafood in center of nori; add mayo, hot sauce or a sprinkle of turmeric for added flavoring. 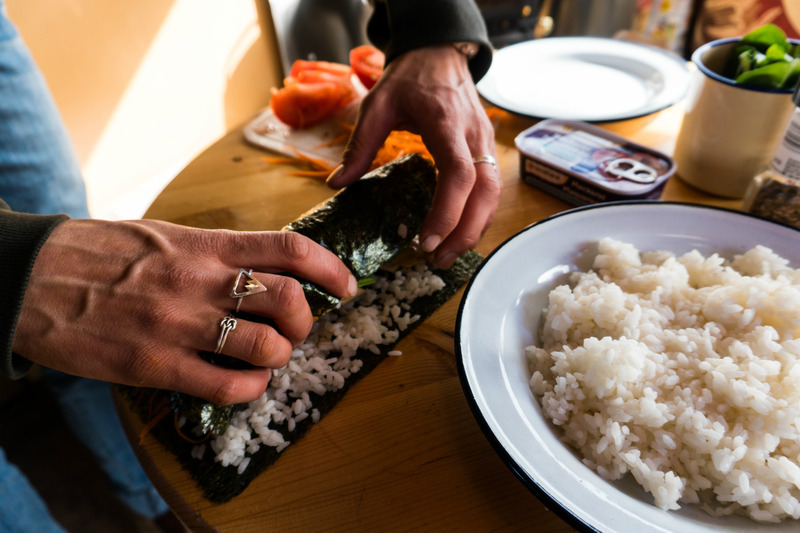 Tuck contents into burrito with fingers while rolling nori tightly with your thumbs. Be careful not to roll too tight or the nori paper will rip. Slice or leave whole. Wrap burrito in tin foil to minimize mess and maintain structure. Or cut in half for instant consumption. Beginner’s warning: While rolling skills are still developing, it’s totally acceptable if your burrito turns into a sushi salad. It’s all the same to your stomach. With a little preparation and some creativity, spring outdoor eats can transform from straight fuel to finesse. Open your cupboards, fridge and pantry and get adventurous with some on-water, power-packed meals! Editor’s Note: All photos courtesy of Rok Rozman unless otherwise noted.